Blade length : 63.63 cm or 25.05 inches. Sori : 2.12 cm or 0.83 inches. Width at the hamachi : 2.90 cm or 1.14 inches. 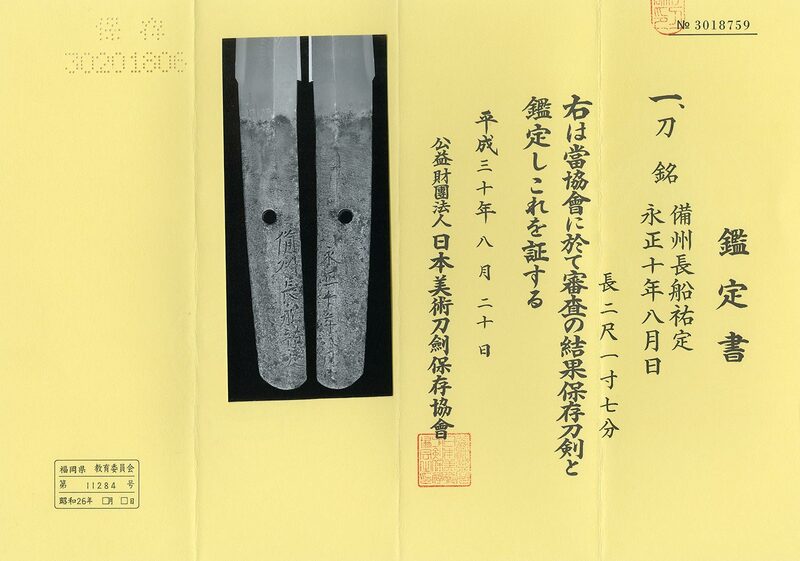 Width at the Kissaki : 1.98 cm or 0.78 inches. Kasane : 0.70 cm or 0.27 inches. Shape : Katate Uchi style, regular size width and thickness, relatively long Nakago, deep Sori. Jigane : Clear and beautiful Jigane, Ko-Itame Hada well grained with Jinie attached. Utsuri apparent, Kitae-ware around Kissaki. Hamon : Nie Deki, Suguha. Soft feeling Nioikuchi. Ko Ashi working. Boshi is Maru. Special Feature : In the Muromachi period, Harima, Mimasaka and Bizen province had been prospered under the protection of the Akamatsu family. on top of that, there’re many talented swordsmiths in Bizen area. 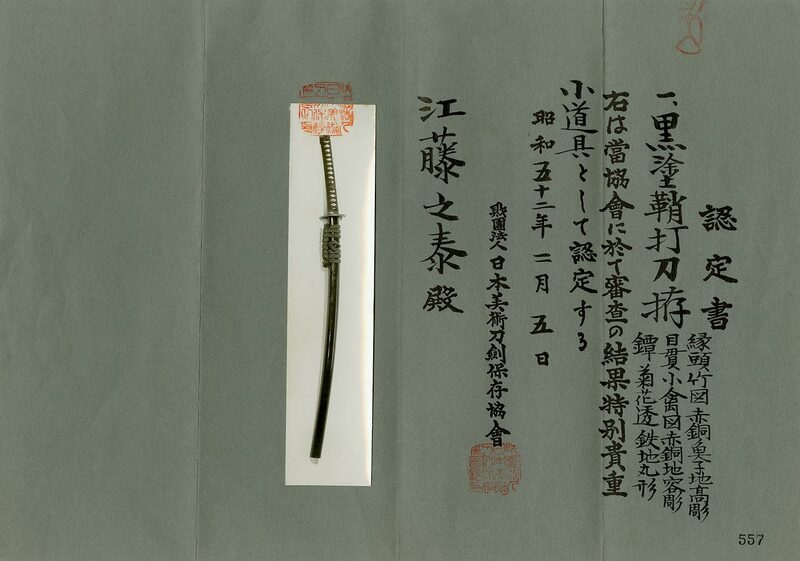 The Age of Provincial Wars in Japan gave rise to the great demand for swords this period. The battle style changed from cavalry battle which was common in Nanbokucho period to infantry battle. 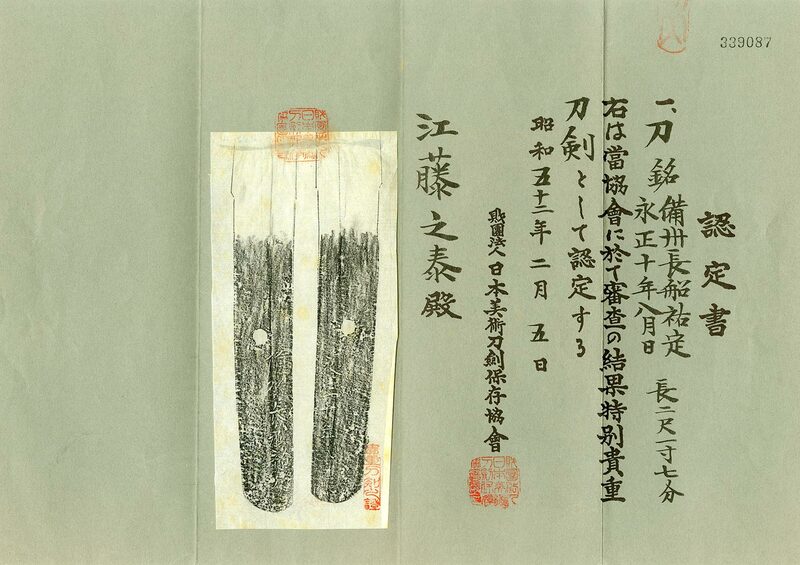 accordingly the length of the sword also changed from magnificent Tachi to Uchi-gatana for usability. Incidentally, Japan was carrying on a brisk trade with China; Ming dynasty at that time and the sword was very important key commodity. Sukesada has become a synonym for the Osafune School. About twenty Sukesadas are noted on directory and the large quantities of their swords are still survive. Tsuba : Round iron Tsuba, chrysanthemum design. FuchiKashira : Shakudo Nanakoji, bamboo design. Menuki : Shakudo, the bird on the tree design. From Aoi Art : The Jigane of this sword is very nice, it looks clear and bright with Utsuri apparent but there’s Kitae-ware unfortunately. Unfortunately this blade has some Kizu but we think it’s inevitable considering the fact that the sword was made over 500 years ago. but the shape of the Nakago remains almost unchanged. The Koshirae is themed on plants, looks good.